This beautiful vintage 14 karat gold locket and chain came from a local estate. 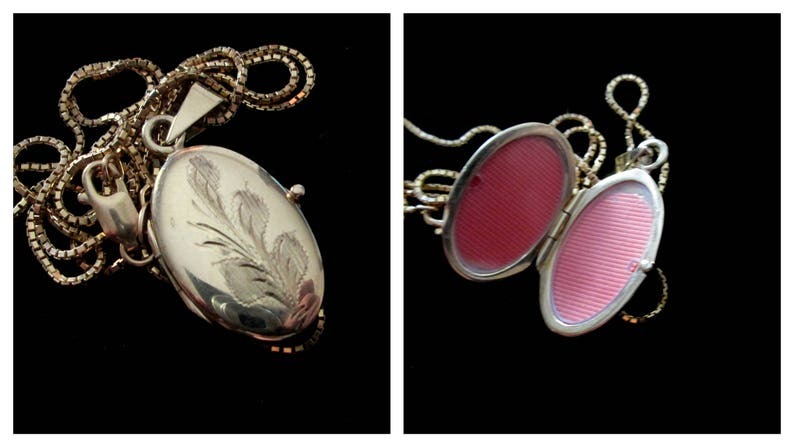 It is a beautiful oval shape with an etched flora design on it. It opens to hold 2 photos under plastic lenses. There is a small notch where you can remove the lens, add your photo and then replace the lens. The chain is a delicate box chain with a lobster clasp. Both the locket and chain are stamped "14k Italy"
This chain measures approximately 20 inches and the locket is approximately 15 x 23 mm.